Another recipe for you guys! This one is perfect for the Nutella nuts! 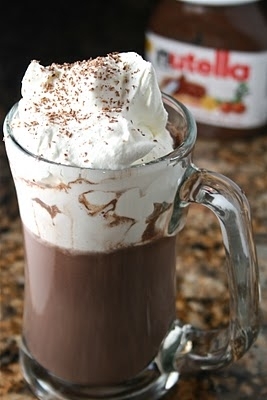 Nutella hot chocolate and a home made whip cream mix to! Hope you guys like this yummy homemade simple treat! In a small sauce pan over medium heat, whisk all ingredients together until well blended and hot. Pour in a cup and top with homemade whipped cream and shaved chocolate. Pour all ingredients into the chilled bowl and start to beat. Start off on low and gradually work your way up to high. It will be done when it is the consistency of ..well…whipped cream. Don’t over beat.